Stranger: So how many kids did you say you have? Stranger: And you homeschool all of them? Stranger: How do you homeschool four children of all different ages. Me (smiling): Well, sometimes it isn’t easy. After this one of two things happen. If the random stranger now thinks I’m crazy and is just asking me these questions in an “I can’t believe there are people who really do that” sense, I steer the subject away from homeschooling and move on. If this is a person who truly is interested- especially if it’s a new or prospective homeschooler- I take the time to really answer the question. Because I’m a relaxed, eclectic homeschooler, I’ve been able to accommodate homeschooling multiple ages together pretty easily over the years. Unit studies are great for this. But I do know homeschooling families who use different homeschooling methods. So I hesitate to throw out, “Just do unit studies,” as my only answer to this question. Instead I try to think of families I know who do use other homeschooling methods and how they make homeschooling multiple ages together work in their homeschool. Here are some of the common homeschooling methods and some tips for homeschooling multiple ages that you can use with each method. There are also some general tips that will help homeschooling multiple ages flow more smoothly no matter what homeschooling method you prefer. The Charlotte Mason method of homeschooling has several main principles and methods. Some of these are short lessons, living books, narration, nature study, and reading and studying Shakespeare. This homeschooling method lends itself to multiple ages homeschooling very well. It’s easy to combine children for many of the lessons that you are teaching. Read aloud books from a variety of reading levels. Much of a Charlotte Mason education is built upon living books, books that are meaningful and interesting and timeless. When you have children of multiple ages, choose books of different reading levels and read aloud for the whole family. You’ll be amazed at how much your younger children pick up from more difficult books and by how much older students can enjoy books from a lower reading level. Divide your day into whole family learning and individual learning. Subjects such as history, Bible, nature study and science can be done as a family by reading books aloud together. Read books on these subjects with the whole family and allow children to narrate. While younger children might not grasp everything at once, having older students narrate can increase comprehension, not only for the child narrating but also for the younger children listening. Take a portion of the day to do these together subjects and then separate to do individual work in subjects like math and language arts. Use notebooking so that children can process information at their own level. Notebooking allows kids to process the information they’re reading or hearing read aloud. When you read to multiple ages together, they can complete notebooking pages at their own level to help them process what’s being read. Older children might write a complete written narration of a passage or record detailed facts as you read. Younger children might draw or color pictures that go along with the reading. Unit studies are my favorite way to include the whole family in learning together. A unit study involves choosing a topic and building learning from all academic subjects around that topic. Unit studies usually involve a mix of reading books about a topic and doing hands-on activities to explore the topic. Sometimes a unit study is accompanied by a lapbook where children make mini books that record things they’ve learned in the unit study. It’s very easy to use a unit study with children of all ages together. Have children all learn the same topic, but have them do different things with what they’ve learned. A unit study involves learning that is focused around a specific topic or around the story and theme of a book. Children of all ages can hear the same material presented, but the response to learning happens in different ways based on their ability level. For example, if you are doing a human body unit study with your children, older students may have a graphic that has them label all of the systems and organs in the human body. Younger children may have a similar graphic but only label some of the major parts of the body- heart, lungs, stomach, etc..
Give older children access to more difficult materials and books in addition to the ones you’re using together as a family. In some subjects, such as science, older students need to have access to more difficult material. For example, I used a unit study that covered history from Rome to the Reformation with three of my children who were 2nd, 3rd, and 8th grade. The activities that we did together as a family had enough depth and detail for my younger girls. But my middle school aged son needed more. He used a separate, more rigorous book for science and read some more difficult history books on his own. 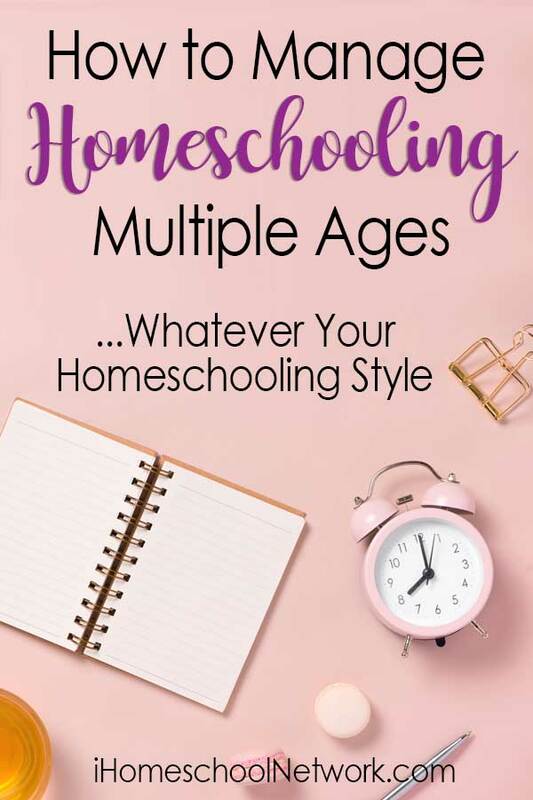 I have to admit that, other than a few years at the very beginning of our homeschooling, we haven’t been a very traditional, textbook-based homeschooling family. It seems much harder to do this with multiple ages of children. But I’ve had a number of friends who have done this successfully, and these tips are ways that I saw them make this method work with multiple ages of kids. Stagger work that students can do independently with work that they need help with. No matter the ages of your children, there are likely some things in the curriculum that they can do independently- coloring pages for young children, simple books for early readers. Plan your schedule so that the times you need to work one-on-one with your children is staggered with things they can do independently. This will allow you to rotate through helping each child. Keep educational toys and manipulatives on hand so that younger children can use these while you work one-on-one with older children. Educational toys, puzzles, and art supplies can keep younger children busy and learning while you are working on book work with older students. My children have always loved wooden magnet sets, large floor puzzles, math counters, and other learning toys like these. PlayDoh, crayons, markers, and other art supplies are also things that younger children can use independently. No matter what homeschooling method you prefer, there are some general tips to make homeschooling multiple ages a little easier. Keep consistent schedules or routines. Some homeschool moms prefer a structured schedule. Others- like me- prefer more flexible routines.Whichever fits your personality, sticking with a schedule or your routines can be a life-saver when it comes to homeschooling multiple ages. When you create a flow to your day every child knows what to expect and knows when you’re going to be working with them and when the family is learning together. Teach children to be independent learners. One of the biggest helps to homeschooling multiple ages can be having kids who know how to work independently. This is a skill that can be taught beginning with young children. As children learn to manage their own time and to move from one task to another on their own, they will need your individual teaching less. As children get older, you can become more of an overseer of each student. This will make homeschooling multiple ages much easier for you. Leah Courtney is a child of God, wife, mother, and homeschooling mama. She’s homeschooled four children since birth, and is now the mother of two homeschool graduate. In her (very rare) free time, Leah loves to read and color complicated pictures while listening to audio books. You can find her blogging at As We Walk Along the Road where she’s posting literature-based homeschooling resources and encouragement for other homeschooling mamas.